Here's the complete rally stage schedule for the 2015 Dakar Rally, as provided by Robby Gordon's Speed Energy race team. This'll let you know exactly where the competitors are battling it out, and help give you an idea of the event's massive scale. See how to watch the race on TV or online anywhere in the world right here. Buenos Aires to Villa Carlos Paz. 833 kilometers. 663 km Liaison and 170 km Special. The competitors will be rapidly plunged into the heart of the Argentinean countryside. The combination of the route's different features means there will be something for everyone, while sticking to relatively simple criteria, for the time being. Fast tracks coupled with sharp bends will divide up the vehicles, according to the levels of the drivers' skill. Villa Carlos Paz to San Juan. 625 kilometers. 107 km Liaison and 518 km Special. The longest stage. Any rest will be short-lived, because before reaching San Juan, the competitors will have a particularly busy schedule: quite simply the longest special stage in the rally, which is varied enough to unsettle even the most experienced of drivers. Hard terrain at the start of the race will be followed by dusty sections in the middle of the day and a sandy stretch to finish. This is the first real test, which can only be successfully overcome through constant vigilance. San Juan to Chilecito. 542 kilometers. 258 km Liaison and 284 km Special. The pressure which competitors faced the day before (and late into the night for some of them), will partly ease off on the road to Chilecito. The shorter and less intense stage will allow them to enjoy their majestic surroundings. The red earth tracks, overlooking steep peaks and plunging down into canyons, will take the Dakar through one of the most beautiful regions of Argentina. With thousands of stones to be avoided, it will only take one to ruin this magnificent day. Chilecito to Copiapo. 909 kilometers. 594 km Liaison and 315 km Special. The competitors will have to prove they are worthy of entering Chile! A very early start and a climb to a height of 4,800 meters will precede the border crossing at Paso San Francisco. The really challenging section will begin with a gradual warm-up on the mining tracks, before drivers are faced with the reality of the Atacama Desert. The route here is open and sandy. Over the course of the last 40 kilometers, the giant dunes and basins of Copiapo will have to be tackled and for many this will be at night. Overcoming them will require finesse and instinct. Copiapo to Antofagasta. 697 kilometers. 239 km Liaison and 458 km Special. At the start of the race, the most confident drivers will be able to take advantage of the fast tracks to try to move up in the overall standings. But the temptation to do so may be risky, particularly in the hard-to-handle fesh-fesh areas where absolute self-control is the only guarantee of success. Overtaking here requires precision handling to the extreme. Antofagasta to Iquique. 647 kilometers. 392 km Liaison and 255 km Special. The route will climb up the Pacific coast towards Iquique and run alongside the coastline. For the first time, the half-way point in the race will be marked on a podium in the center of Iquique. The encounter between drivers and their fans will be emotional, following the earthquake which affected the region at the start of the year. Iquique to Uyuni. 717 kilometers. 396 km Liaison and 321 km Special. Numerous difficulties will mark the first part of the Bolivian marathon stage. From the outset, the long liaison section will mean an early start, followed by a gradual climb to a height of more than 3,500 meters. Once on the high plateau, the special stage will begin, with instructions to follow the roadbook with great care, in light of the large number of junctions on the route. One of the challenges of the day could be wear and tear on tires. Once they have arrived in Uyuni, the competitors will only have completed half of the marathon stage. Uyuni to Iquique. 805 kilometers. 24 km Liaison and 781 km Special. The Dakar bows to the laws of nature. Hence, the weather will decide which route will be taken to leave Bolivia. If it's dry, the start could take place in the Salar de Uyuni, for a 100km route across a smooth road of white salt: full throttle and foot to the floor. The route then slows down abruptly, with the longest part of the special stage taking place on more technical mountain terrain. The day will end with more than 40km of dunes, concluding with the high descent to Iquique. Iquique to Calama. 539 kilometers. 88 km Liaison and 451 km Special. For this farewell session to the Atacama Desert, the drivers will face approximately 50 kilometers of demanding sand dunes. Despite these challenges the drivers should enjoy the stage because the next stage will put both drivers and their teams into much less comfortable positions. The routes have suffered the rages of time and will be harsh on them: frequent potholes and bumps combined with the narrowness of the tracks will expose their vehicles' bodywork to damage. Calama to Salta. 860 kilometers. 501 km Liaison and 359 km Special. After the Chile-Argentina border, the day's special stage will start on the Salinas Grandes, more than 3,600 meters above sea level. The altitude should curb the competitors' enthusiasm and cool down their engines. The more technical final phase will separate the toughest of them from the rest. For the liaison section, the route will then follow the Paso de l'Acay, at an altitude of 4,970 meters. Salta to Termas de Rio Hondo. 520 kilometers. 326 km Liaison and 194 km Special. The rally will continue on two separate routes, following the famous Ruta 40 and winding through its magnificent landscapes. Drivers won't have time to relax on these fast routes though: the fatigue which will have accumulated by the 11th day of the race will demand maximum concentration on both the route and the road-book. In the cockpits of the cars, the watchword will also be vigilance; these tracks are often lined with trees. Termas de Rio Hondo to Rosario. 1,024 kilometers. 726 km Liaison and 298 km Special. The Dakar will spend the night near the Termas de Rio Hondo circuit, which regularly hosts the Argentine rounds of the GP and WTCC motorcycle championships. The Dakar's competitors are set for a cross-country journey, battling it out in this tension-packed penultimate day. A combative driver could still shake up the leaders' positions even at this stage. And drivers who become too distracted could be caught by surprise by the surrounding vegetation. Rosario to Buenos Aires. 393 kilometers. 219 km Liaison and 174 km Special. None of the drivers in the Dakar consider it over until they reach the end of this final day; and for good reason, because every year at least one competitor retires during this final stage. Caution is the name of the game on the fast tracks of the special stage, at the very least for those who haven't got a position to defend. Jalopnik is following the 2015 Dakar Rally, hang with us on the sun-scorched sidelines of the Dakar Rally right here! 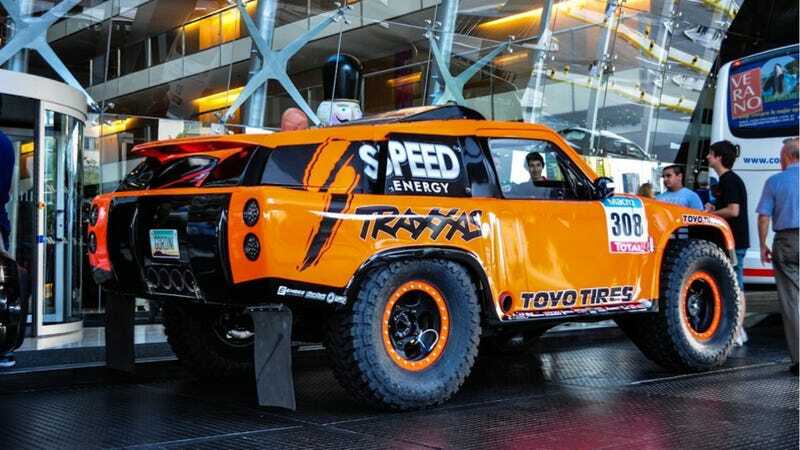 Hat tip to Robby Gordon!